Welcome to the Tartan Parade! We're so glad y'all are joining the 4-day party (April 1-4). Now, show us your tartans! Last year for National Tartan Day, I did a more "traditional" tartan post with a Highland Tea, using my MacGregor tartan. In case you missed it, you can see it HERE. 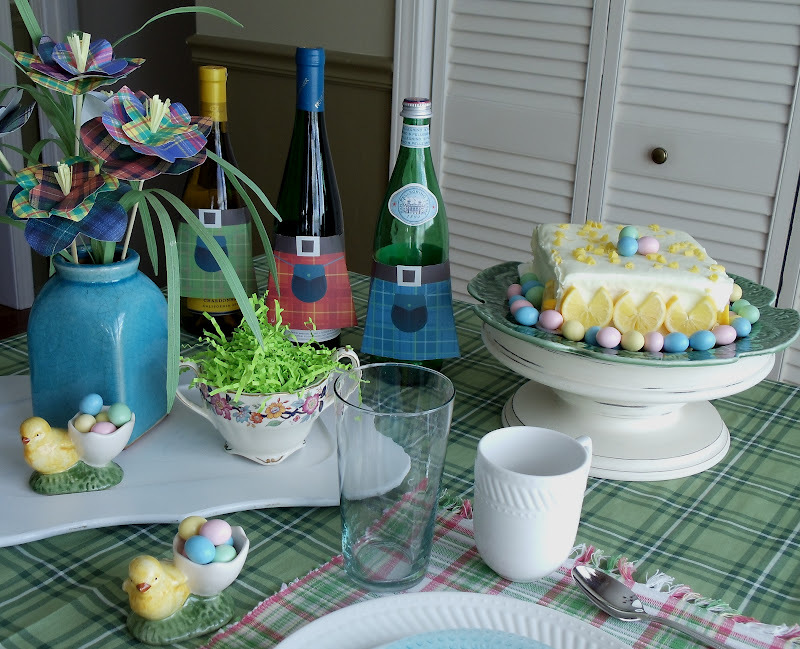 But this year, since Tartan Day and Easter are so close together, I thought I'd do a fun and frugal Tartan Easter-ish tablescape. Note: In North America, the terms tartans and plaids are used interchangeably. Being the frugal gal that I am, I wanted to use decorations that cost very little...or nothing! ...kilts for bottles. Aren't they cute? They are a free download from...Here. All you have to do is print, cut them out, add a bit of glue or tape, and you have cute, fun kilts for your wine or water bottles. Now that the drinks are covered, I started thinking of how to decorate the table. The tartan patterns I used were another free printable download from...Here. I cut three different sizes of flower shapes and different tartan patterns. The stamens are made from half a post-it note, which I fringed and taped to a wooden skewer. Then I made little holes in the center of the flowers, stuck the skewer through, and added "leaves" from an old piece of faux greenery. ...I made some from the same tartan pages I used for the flowers. Just cut a strip of the paper, tape it on the back.. ta da..instant napkin rings! I mixed and matched the dishes the same way I mixed and matched the tartans...hopefully for a fun look. The cake is one of those frozen ones from the grocery store that cost about $3 or $4. ...there, you have a tart 'n' lemony cake. Ok, I know that was an awful pun, but I'm glad you joined in the fun. If you haven't visited Alison's, Sarah's and Delores's blogs, stop by and see what's happening there. Babs, this is darling! I love that you made the kilts and the tartan flowers. Your are a clever gal! 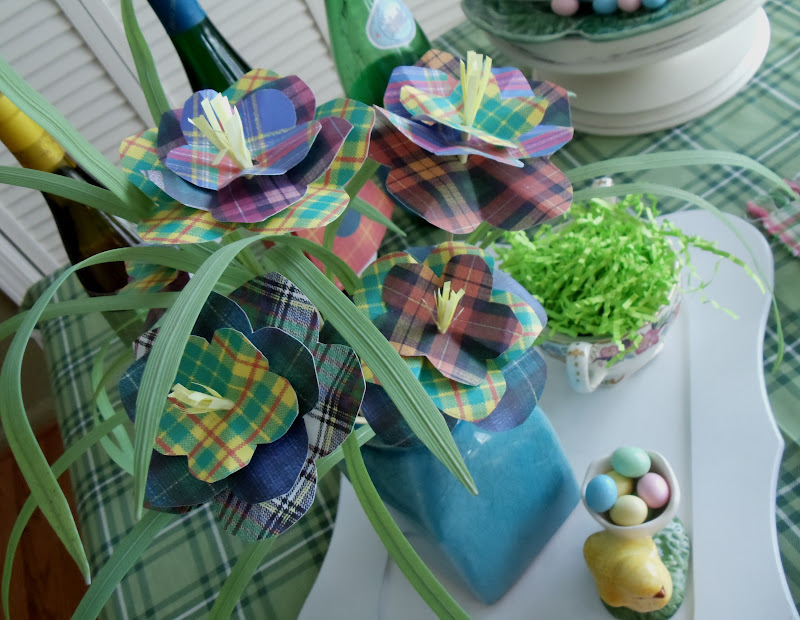 This is a perfect table for celebrating Easter with a tartan twist. The cake looks both pretty and delicious. Meyer lemons ~ yummy! You have been busy, Babs! How cute are those bottle kilts? May have to steal, I mean borrow that idea from you! Your tablescape looks fantastic! So excited to be a part of this --- sharing the Parade with the three of you this month.... Parade Marshal extraordinaires! Be sure to link up your post at one of the three blogs in the morning. Does not matter which one! Your paper flowers are adorable. your cake looks delicious. This is such a fun table, Babs! The kilts and flowers are darling, very clever! The cake is wonderful, too...love the "tulips"! What a sweet spring time table! Easter plaids! I love it! The bottle skirts are so creative and I love the tulip lemons. Love it! The bottle kilts are adorable! And your tart n lemony cake so clever! You have been busy! Babs, what a cute table. Only you would think up a tartan Easter scape. Oh Babs I love every single element. I have linked up an oldie but goodie post of a party we did for my Scottish husbands retirement from the military. Thanks for hosting. 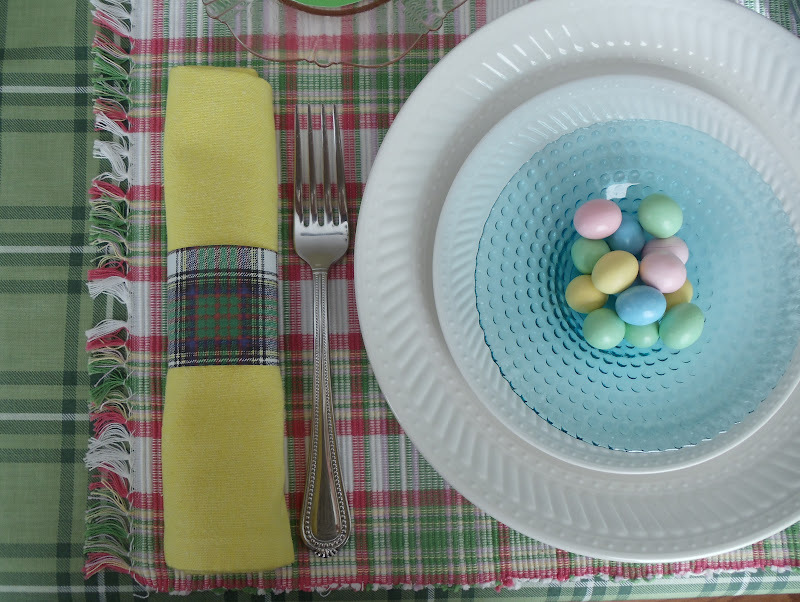 Well you answered the question I've been asking myself: yes, you can have a tartan table for Easter! You killed it with your bottle kilts, lovely soft plaids and the tart 'n' lemony cake! It's all just wonderful! Babs this is so much fun. The lemons as tulips look great. All glitches at Magical Christmas Wreaths Blog are fixed you can leave comments to your hearts delight now. Oops. Oh My Goodness Babs, this is just adorable. I love those little aprons on the bottles. The pretty plaid floral petals for the arrangement is precious, colors perfect for Spring and Easter. 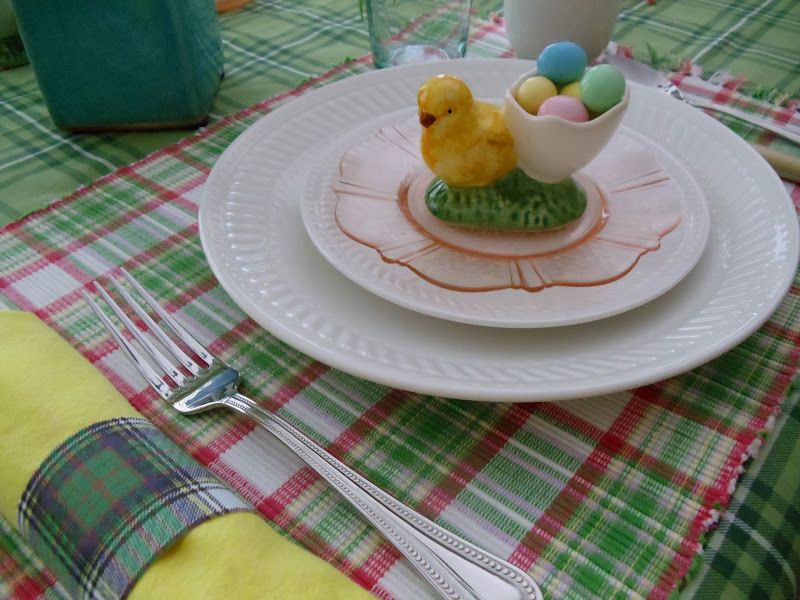 Love the place settings and the chick/eggs holders just too cute. The cake looks delicious. Thanks for hosting Babs. Hi Babs! Oh how I love those adorable kilts on the bottles. I am going to make some right now. How clever of you to think of it! Thanks so much for hosting such a fun Tartan Parade. What a great idea to add tartan to an Easter table! 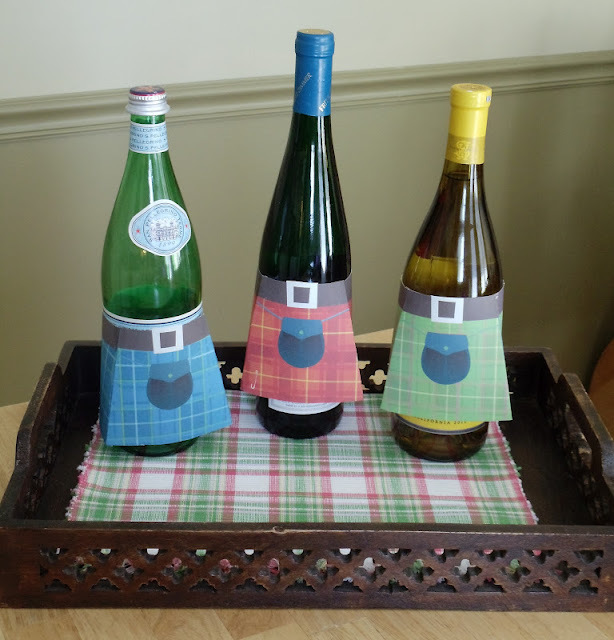 What a great idea to make Bottle kilts! I love the tartan flowers! This is so cute! Your imagination had a good time with this! Love all your tartan flowers and kilts! 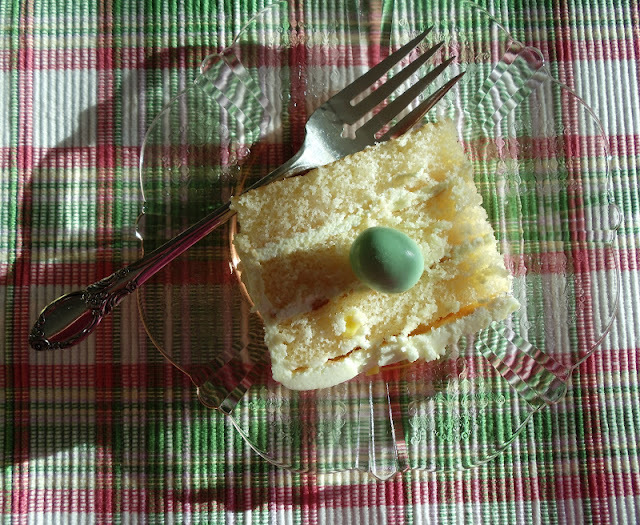 Your fabrics look great together and your gussied up cake is the cutest! 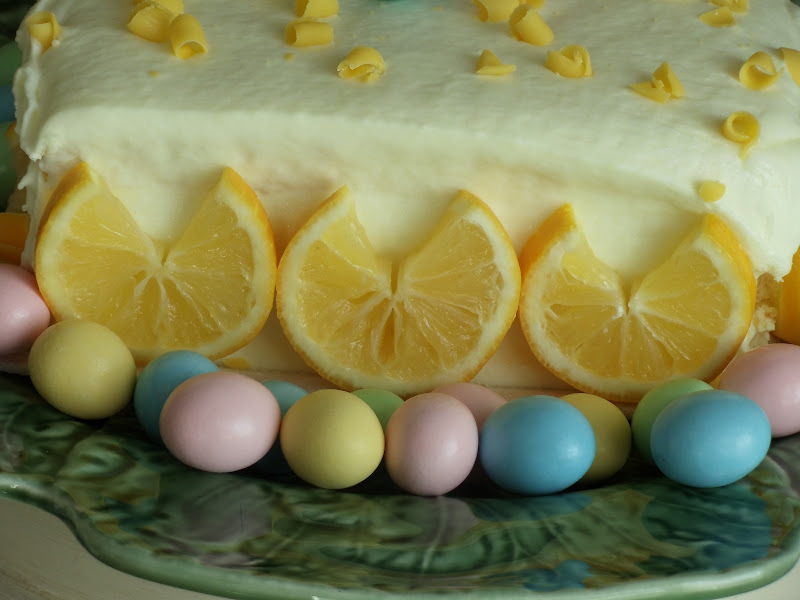 I like the lemons cut like that ...I just want to dive in! 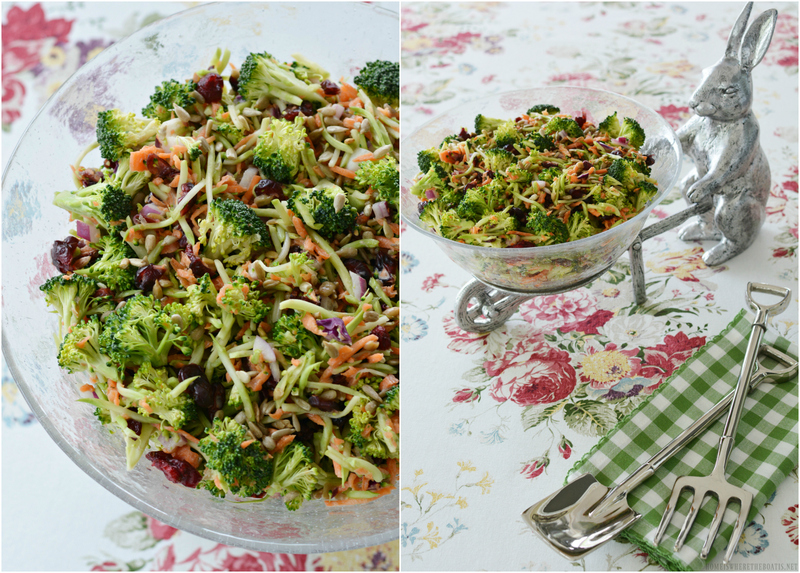 I love the "lightened up " approach you took! Those flowers are waaay cute. You get the creative Easter table award! Just adorable! You're so creative. I just love how you decorated those wine bottles and made those homemade tartan flowers. I didn't realize you were so crafty! That cake sure does look good. I love lemon desserts. 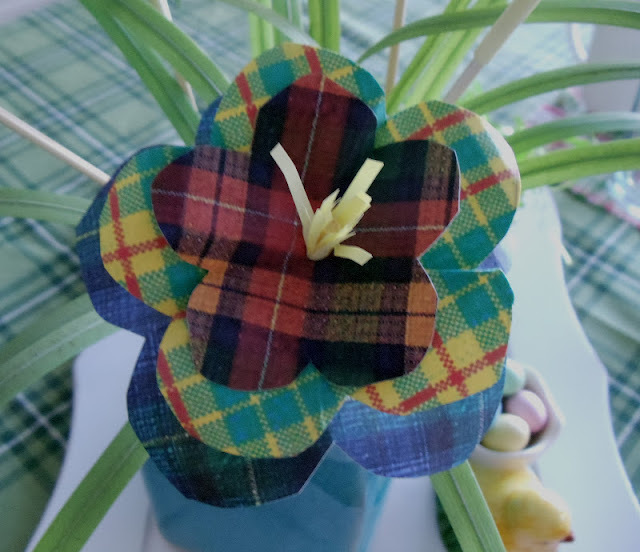 The tartan flowers are the cutest. Richard from My Old Historic House. Wonderful tartan post Babs! I loe the wine kilts. Oh Babs, this is adorable, you did such pretty tartan vignettes and table. I love the table mats in that soft plaid, very pretty, along with the plates on top too. You also cracked me up, lol..I'm so inspired to look for plaids to make place mats, or even a tablecloth! Wishing you and yours a HAPPY EASTER SUNDAY. Hey Babs I made it! So sorry I'm late. I had such a good time putting this post together. Great inspiration. By the way...your cake is my absolute favorite! I'd rather have that than one made from scratch...strange but true. :o) I'm off to visit some of your party links. Thanks for hosting! This is SUCH A SWEET Tartan tribute! Love the SPRINGY LOOK you gave. My VERY VERY FAVORITE(other than the tart 'n' lemony cake), is those TARTAN FLOWERS!!!LOVE,LOVE,LOVE! I am definitively going to be trying to make those! Happy Tartan AND Easter to you!!! Your mixture of tartan plaids & Easter is so well done. It all looks fantastic, Babs.